Matrix Professional hair care is the colour range of choice at Hair Elements. With the assistance of Matrix’s extensive colour range, we can create the perfect colour formula for you. 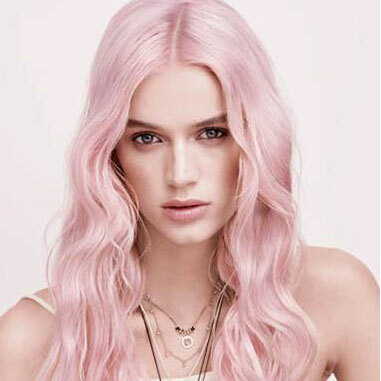 We specialise in foiling and creative colour techniques and we are pleased to offer an ammonia-free colour option. View prices for colour services below, and read more about our colour techniques including highlighting and balayage. * extra length with styling and colouring may incur additional costs. * more than one colour may incur additional cost. Demi-permanent colours are perfect for the client who wants rich, full-bodied colour and brilliant shine. Perfect for colour balancing, toning, grey blending and lowlites. Our Matrix Color Sync and Gloss Sync ranges are both Ammoni-free, and deliver endless condition and shine using Cera-Oil Conditioning Complex technology, providing long-lasting shades with zero lift. If you’re not quite ready to dive into the world of permanent colour, then this is the service for you! We offer a great range of permanent colour options with an impressive colour selection chart. Whether it’s vibrant reds, rich earthy browns, or beautiful honey blondes, we have the perfect shade for you. For the blondes, our Ultra Blonde Series delivers high precision, high shine, perfectly toned blondes in one step. We can transform you into a sandy beige or icy iridescent blonde whilst sill caring for the hairs’ condition and integrity. You want red? We’ve got red! Our Matrix So Red tones deliver high impact results that are bright and pure. And if you just want those greys covered, we can sure do that. Matrix’s extra pre-blended tones give maximum coverage specifically designed for over 50% grey hair, and also offering beautiful soft natural tones. At Hair Elements, we are also very proud to offer Ammonia-free odourless permanent colour. Matrix’s COLORINSIDER range with its unique and patented Oil Delivery System2 technology delivers high-resolution colour with 100% grey coverage. It offers a wonderful selection of colours and tones, delivers gorgeous shine, no scalp discomfort and no odour, and produces stunning colour results. COLORINSIDER Ammonia-free is the perfect option for the client that is a little scalp sensitive, suffers from allergies, or just wants a more natural approach to their colour. You’ve been blonde for too long, you want to go dark brown? Or are you’re tired of your vibrant red and would love to lighten up to a honey blonde? This is where colour correction comes in… But it’s not for the faint-hearted! Depending on what you have, and where you wish to go with your colour, this service can take longer than a regular colour appointment. Due to the massive variables in this procedure, we need to see you in the salon and have a thorough consultation before we can make an appointment. Our focus is on maintaining the integrity and optimum condition of your hair throughout the transformation. We will always recommend the correct treatments and after care routine in order to maintain your hairs’ condition and manageability. We would be happy to chat to you about your next “hair adventure.” Come and see us for an obligation-free consultation. Let us create that perfect colour to give that ‘lived in’ feel. We use techniques such as balayage, face framing babylights, free-hand painting, colour melting and shadow foils. Every head of hair and desired result is different, so what is why we quote after thorough consultation. Colouring hair doesn’t need to consist of one shade only. We have so many different techniques that can create such a varied result. Foil highlighting is a great technique where, by using different colouring products, can produce a varying result. Whether it is sun-kissed lightness, deeper tones and shadows amongst a base shade, or vibrant slices that “pop” from underneath, foil highlights are a great way to produce a unique colour to enhance your cut and style perfectly. The technique balayage or “ombre” is also very popular and in demand these days. These techniques also are a form of highlighting, but create a more “worn-in” feel, where they melt into a colour rather than coming directly from the root area. The effect can be subtle or quite contrasting…it’s really up to you! We’ve certainly seen a lot of the celebrities sporting some gorgeous versions of balayage. Let them be your inspiration… They’re certainly ours! At Hair Elements, we are experienced in all foil highlighting and more free-hand balayage techniques and can certainly assist you in choosing the best colour and look for you.